Who can apply for a ticket? Any member can apply for tickets but each match attendee MUST be a member of Arsenal Canada. If you are requesting a ticket for you and a friend, both of you must be a member of Arsenal Canada before you make the ticket request. When does Arsenal Canada have access to request tickets? Our ticket application windows are posted to the Arsenal Canada facebook page, our twitter account (@ArsenalCanadaSC) and on this page. Our ticket window usually closes before the Silver member window opens. This means that we normally know if we are successful with our request well before a match is to take place. How much to tickets cost? Once a ticket request is confirmed by the club you will get an email from our ticket liaison stating how many you received and what the total owing is. Payment needs to be sent via interac email money transfer and those details will be provided in the email to you. Can I get tickets to an away match? We generally do not get access to away match tickets, nor Wembley tickets. Sometimes, something comes up at the last minute, but only members of the Arsenal away scheme (or Gold/Platinum members) can get away tickets. Overseas supporters clubs all sit in the same section in the Clock End, Behind Goal Upper, or Behind Goal Upper Back. In rare situations we get tickets in the corner, but it is rare. There are no guarantees for a couple of reasons. First, we share tickets from a pool with all of the other supporters clubs. Second, sometimes we receive a very large number of ticket requests from our members, and we have to have an internal lottery to distribute the tickets. For more information on this, please fill out the webform at the bottom of this page. Prior to last season we had filled 100% of our requests, last year we had two matches with partial allocations. Please also note that all games are subject to change. If you have any additional questions, please do not hesitate to contact our ticket liaison using the form. above. Welcome to Arsenal Canada Supporters Club 2017/18! 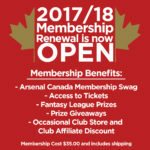 Become a member of Arsenal Canada.